Do you want to get The Last Best Box or send it as a gift, but can't wait until the next month's box is shipped? Consider one of our Summer Snack Boxes. 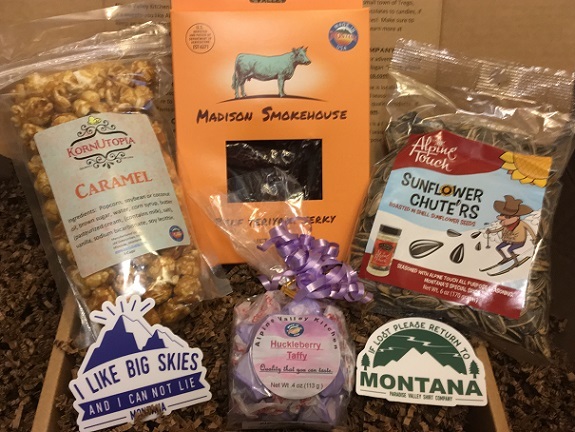 It includes Caramel Kettle Korn from KornUtopia (Missoula), Huckleberry Taffy from Alpine Valley Kitchen (Trego), Montana Themed Stickers from Paradise Valley Shirt Company (Bozeman), Beef Teriyaki Jerky from Madison Smokehouse (Ennis), and Sunflower Chute’rs from Alpine Touch (Choteau). **This box is separate from the monthly subscription, and can be shipped anytime. We use USPS 1-3 priority mail, and generally ship your box 1-3 days after you place your order. Contact us if you have any special instructions! Cheers!